The special teaser of the film Kobbari Matta is finally out on Youtube now. The Sampoornesh Babu starrer is going to create new trends now in the film industry. Sampoornesh Babu will be seen in three different roles of the film. He will be seen as Pedarayudu, Paparayudu, and Android. All these three roles are expected to be humour oriented. The teaser released today revealed the role of Pedarayudu alone. Pedarayudu role is similar to that of Mohan Babu’s and Sampoo tried to imitate him. The film also stars Mahesh Kathi, Shakeela and few other actors. 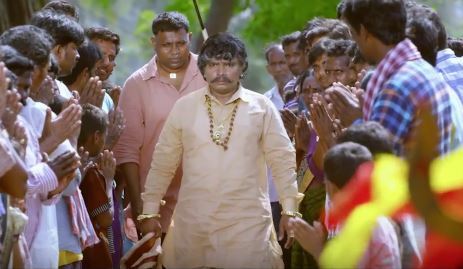 Meanwhile, the highlight of 157 seconds teaser is Sampoornesh Babu’s dialogue about women. Sampoornesh babu delivers a 65-second dialogue about women and impresses big time. The way he maintains the tempo and goes on with the flow is impressive. Steven Shankar aka Sai Rajesh who directed Sampoornesh Babu’s debut film Hrudaya Kaleyam has given the story and dialogues for the film. Rupak Ronaldson is the director of the film. Kamran is the music director. Sai Dharam Tej attended the teaser launch as the special guest. The complete details about the audio and release of Kobbari Matta will be updated shortly.